This dialog box allows you to find duplicate files on your computer, even if they have different file names. It also allows you find different versions of identically-named files, and automatically group them together. Current scan results: Search for duplicate files only in the last scan results shown in the main SizeMeNow interface. This option requires at least one scan to be performed before opening this dialog window. My Computer: Scan all of your local drives for duplicate files. Note that this can be very slow if you have a large number of files and folders. Select Locations: Scan only the locations in the list below. Use Add, Remove and Clear buttons to manage the items in the list. Different versions of the same file: Look for files with the same name, but in different locations. For example, if you have several copies of the file "MyBudget.xls" in different locations (and possibly modified at different times) this option will find all the copies. Identical files named differently: This option will scan the files and attempt to find files with identical contents, even if they have different names. Note that because this option has to look inside of each file, it may be significantly slower than the option above. Only process files larger than: If checked, only files larger than the size specified in the text field below will be scanned. Note that the size is specified in kilobytes. Exclude files with these extensions: If checked, files with extensions matching those in the list below will be ignored during scan. This is convenient to avoid scanning system files, which is partially represented by the default extensions in the list. Use the Add, Remove and Clear buttons to manage extensions. The results panel lists all duplicate files found. 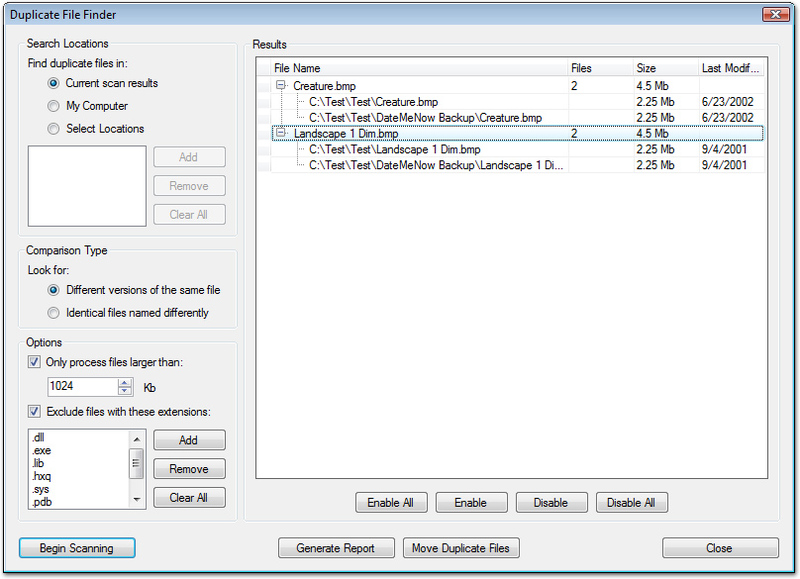 Each category represents a set of duplicate files, and individual files with their respective locations can be viewed by expanding the category. Each item or category can be disabled, in which case it will not be exported to a report or moved to a new location. Enable All: Enables all items and sub-items in the results lists for further processing. Enable: Enables only the selected items and sub-items in the results lists for further processing. Enable: Disables only the selected items and sub-items in the results lists from further processing. Disable All: Disables all items and sub-items in the results lists from further processing. Begin Scanning: This button performs a scan which looks for duplicate files and fills in the results window. Generate Report: Generates an HTML report containing enabled items from the results window and places it into the location of your choice. Move Duplicate Files: Moves all enabled duplicate files from the results window to a new location of your choice, and sorts all versions of the same file by putting them into a single folder. Note: pressing this button will delete all files from their original locations. If you choose to move system or application files Windows or other applications on your system may stop working. Close: Closes the Duplicate Files Finder.